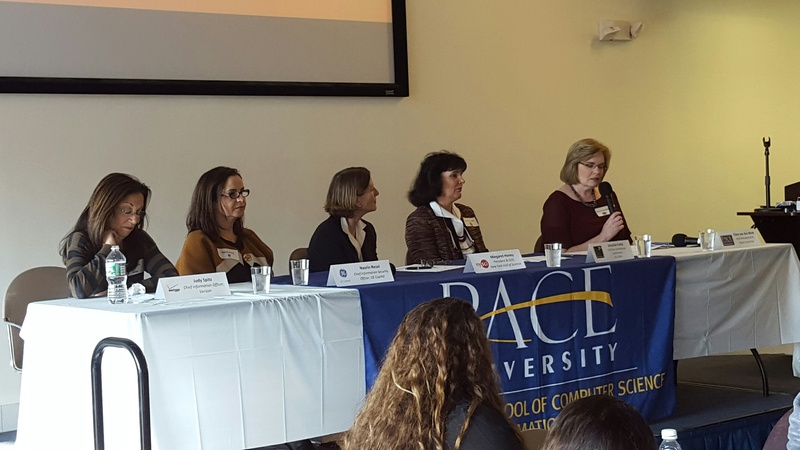 On Saturday, December 12, 2015, a large crowd descended on Pace University’s Pleasantville campus for Pace University’s STEM Showcase Day, an event that celebrated Pace’s Women in Technology initiative and the success of its STEM Workshop for high school female students. 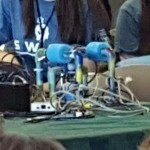 Appropriately called SWAG, “STEM Women Achieve Greatness,” this Workshop offered a rigorous hands-on approach to design and problem solving using engineering and programming tools to create water robots. 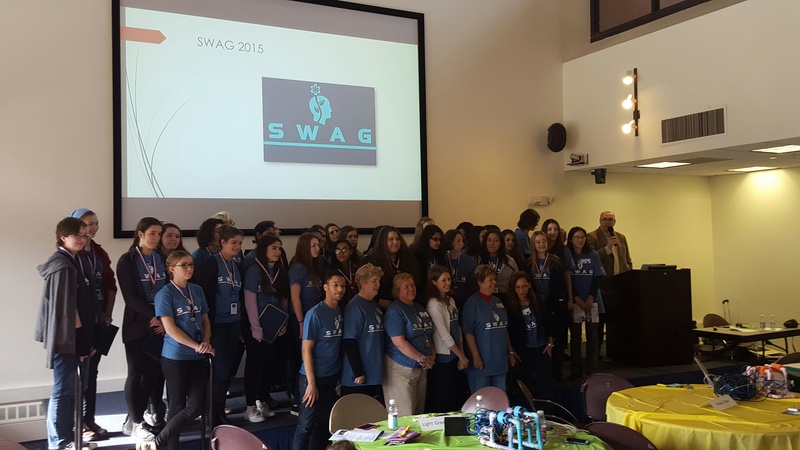 The SWAG Workshop was an incredible opportunity made possible through the generosity of GE Capital, whom Pace is proud to have as a partner in our efforts in advancing girls and women in STEM. Over the course of the Fall semester, 30 high school girls visited Pace on Saturdays to learn how to build and program (using Arduino) a SeaPerch Water Robot capable of taking temperature readings underwater. 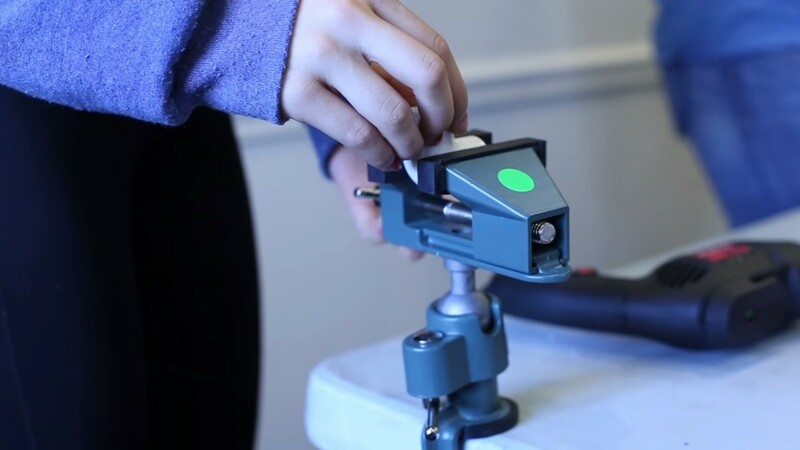 Working diligently during these Saturday sessions, and under the guidance of Seidenberg School faculty and staff, the 30 young women made incredible accomplishments that could go a long way in kickstarting their education and careers in STEM. The showcase began with an introduction by Seidenberg’s Interim Dean, Dr. Jonathan Hill, and followed by welcoming remarks by GE Capital’s CIO, Julie Stansbury. . Attending guests – including many proud parents – viewed video highlights of the journey and successes of the SWAG participants over the past semester (watch it now). 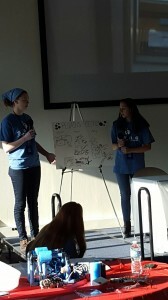 Then it was onto SWAG group presentations! 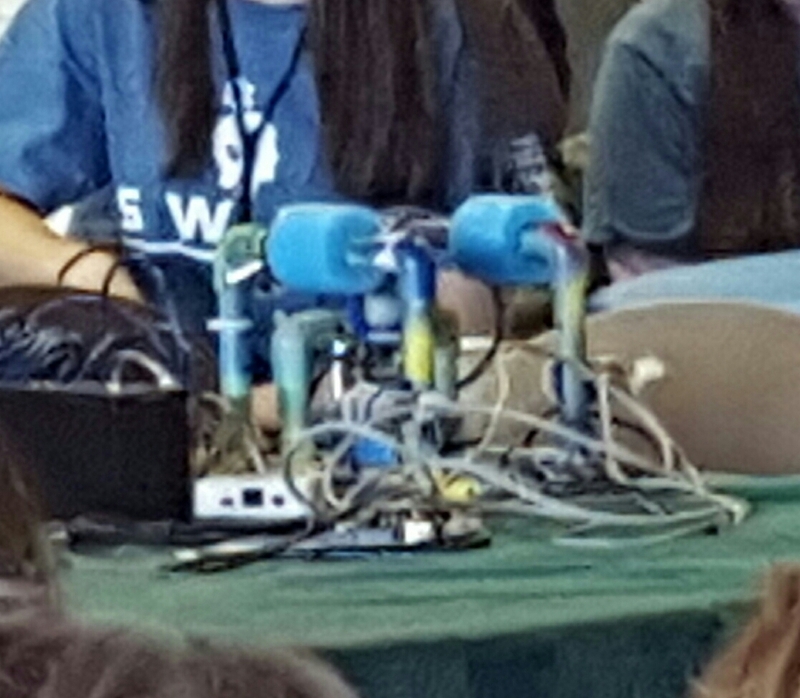 Each team of girls got on stage and talked about their experience building a fully functioning underwater robot, discussing their triumphs and disappointments both, and it was clear that the workshops had been a rewarding experience that incorporated new friendship connections into the STEM education. 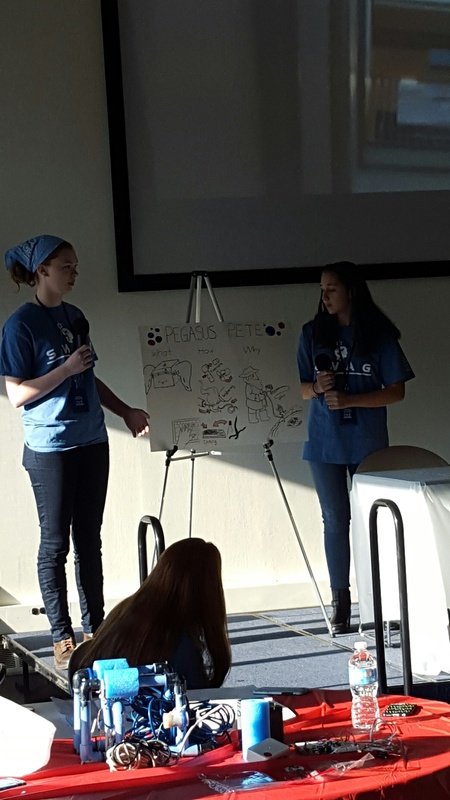 Afterwards, Pace students demonstrated the continuation of hands-on learning in a college environment through group presentations of STEM-based projects, which is part of Pace’s Capstone program. The festivities continued with a panel discussion featuring female technology leaders and executives in the technology sector. 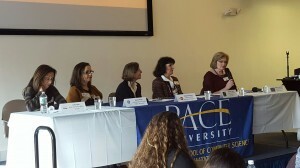 The panel was moderated by VIP and CIO of Pace University Clare van den Blink, and was comprised of Ursuline Foley, CIO Corp. & Enterprise Enablement at XL Catlin; Margaret Honey, President & CEO of the New York Hall of Science; Nasrin Rezai, CIO at GE Capital; and Judy Spitz, CIO at Verizon. The panelists spoke of their experiences and shared profound wisdom sure to be beneficial to the talented high schoolers in the room. To close out the celebration, Dean Hill welcomed Seidenberg School founder, Dr. Susan Merritt, to the stage. Susan presented each of the girls with a medal for successfully completing the STEM Women Achieve Greatness workshop series here at Pace University. A big thank you to all of the Pace faculty and staff who made this event possible: Ms. Andreea Cotoranu, Dr. Pauline Mosley, Dr. Matt Ganis, visiting Instructor Ms. Dawn Tucker, Dr. Nancy Hale, Dr. David Sachs, Dr. Susan Feather-Gannon, Dr. Li-Chiou Chen, Dr. Jean Coppola, Dr. Mary Courtney, Deth Sao, Elizabeth Foster, Nancy Treuer, and Susan Downey. A Special Thanks to Mary Ann Errante from Special Events and Lenny Craig from Buildings and Grounds. We would like to heartily congratulate each of the 30 girls and sincerely hope we see you again when it’s time for you to attend college!